To students in Longwood’s Department of Health, Athletic Training, Recreation and Kinesiology, Virginia is neither a blue state nor a red state—it’s a yellow state. That’s the color they used for the “Old Dominion” in the large, colorful United States maps they painted at 10 elementary schools in seven counties near Farmville. Dr. Allison “Vonnie” Colvin, a “big geography fan” and coordinator of Longwood’s physical and health education teacher education program, is behind the project, which began in 2013 and ended in April with a map at Kenbridge Elementary. 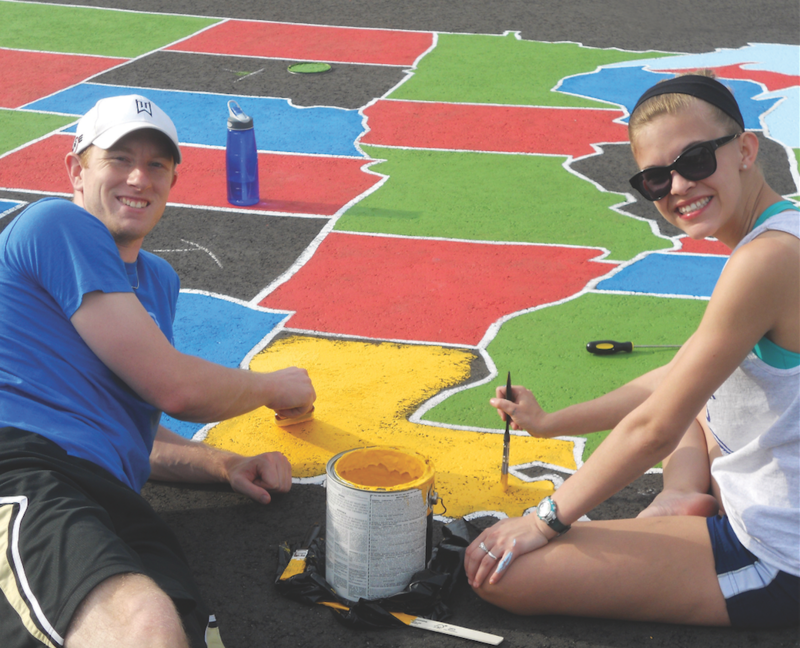 Each map is 35 feet wide and 25 feet tall and was painted in an outdoor play area. Teachers use the maps to teach SOLs and in physical education activities. Funding has been obtained from a variety of sources, including honor fraternity Phi Epsilon Kappa and the American Democracy Project. The Sherwin- Williams store in Farmville also has been a valuable partner in the project, which creates the maps at no cost to the schools. Colvin and the Longwood students also created three world maps as part of the project.